Farrar, Straus and Giroux (BYR), 9780374360870, 280pp. 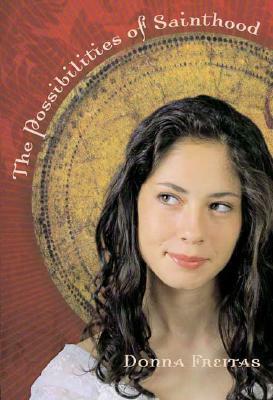 Antonia Lucia Labella has two secrets: at fifteen, she’s still waiting for her first kiss, and she wants to be a saint. An official one. Seem strange? Well, to Antonia, saints are royalty, and she wants her chance at being a princess. All her life she’s kept company with these kings and queens of small favors, knowing exactly whom to pray to on every occasion. Unfortunately, the two events Antonia’s prayed for seem equally unlikely to happen. It’s not for lack of trying. For how long has she been hoping to gain the attention of the love of her life – the tall, dark, and so good-looking Andy Rotellini? Too long to mention. And every month for the last eight years, Antonia has sent a petition to the Vatican proposing a new patron saint and bravely offering herself for the post. So what if she’s not dead? But as Antonia learns, in matters of the heart and sainthood, things are about as straightforward as wound-up linguini, and sometimes you need to recognize the signs. DONNA FREITAS has been a professor at Boston University and at Hofstra in New York. She is currently splitting her time between Barcelona and New York and writing full time.